A big war is very near. A big one, specifically. The one from which we all hide under our blankets. As the past 24 hours have shown, [a big war] is 2-3 hours away from perfect silence. And it is not a certainty that it has not yet begun. I do not share the [popular] optimism regarding the fact that the separatists got their butts kicked and fell back. Neither do I share the belief that they counter-attacked because of fearing an offensive. We should not consider our enemy to be clinically stupid. The fact that yesterday [June 4, 2015], a lot of resources happened to be in the regions that came under attack [Marinka, Donetsk oblast] – that was neither luck nor coincidence. And it is definitely not a reason to walk headlong into superior forces that are ready for an assault. I think it is quite the opposite. This is an indication of the enemy’s preparations. 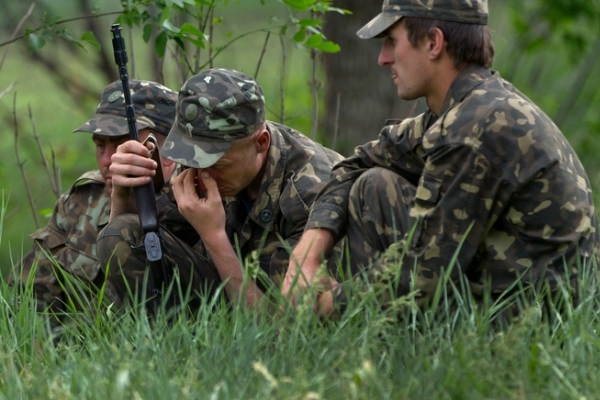 Despite all the hysteria regarding a large winter war, I personally was witness to the fact that the Armed Forces of Ukraine were ready for a terrorist offensive, and foiled it. Awkwardly, yes, but foil it they did. Last night, in my opinion, was in a similar vein. And nothing is over yet. The immediate objective [of the enemy] has been defined. Whether it is their real goal, or merely a red herring – only time will tell. – The relatively quick MoD/General Staff efforts to inform the public. – The very quick response (compared to our past benchmarks) to threats and problems. – The rapid call-up and deployment of reserves. – [President] Poroshenko’s permission to use ALL of our artillery. – The opening of artillery fire with minimal procedural delays. Although, some unidentified unit did hit [the enemy] very hard before the official orders, using large-caliber MLRS. That definitely was not the Ukrainian Armed Forces. The Army are not like that, they don’t do violations. The style [of the attack] was more like the Volunteer Corps – but then, the Volunteer Corps don’t break the rules, either. Some devilry at work there. Recently I came across an article saying that [Dmitry] Yarosh [Head of the Right Sector Volunteer Corps] had received a clean bill of health and headed to the front. Maybe. And of course, the medics. Today, there was no horror where the wounded don’t get driven all the way [to the hospital] or not admitted. But do you know what was the most important thing today, for the rear? The wave of panic, which [different parties] tried to create, whether by habit or to draw attention to themselves – it stopped halfway. It didn’t take off. We are learning to fight, not just on the front line. We are learning to fight in the rear and in the informational field. And we will win. No question of that. Unfortunately, I still strongly believe that a big war is about to happen. No-one is going to take back all those mountains of military hardware. Or re-educate the insurgents who have taken up arms. They will try to use them here. There will be battles. Brutal. Bloody. As they have been before every round of negotiations so far. That is the Russians’ tactics. And the infrastructure and logistics will be damaged. That goes without saying. This entry was posted in English, English News, Eyewitness stories, Others, Pictures, South&Eastern Ukraine and tagged #freekohver, #FreeKolchenko, #FreeKostenko, #FreeSavchenko, #freesentsov, #RussiaInvadedUkraine, #StopRussianAggression, #UkraineUnderAttack. Bookmark the permalink.